He (maNavALa mAmunigaL) divines, now, vAdhikEsari azhagiya maNavALa jIyar, by his wonderful knowledge, gave meanings of thiruvAimozhi which is panneerAyiram (12,000 padi). anbOdu azhagiya maNavALach cheeyar – He divined it out of overflowing love towards thiruvAimozhi. This is like said in ‘bhAshyabhakthirachUchudhath [SrIbAshyam sruthaprakAsikA thaniyan – 10]’ (devotion towards SrIbAshyam flowed into its vivaraNam (explanation)). Or, anbOdu azhagiya maNavALach cheeyar – It can also be said that he divined it out of love towards all sentient beings. This is as said in ‘neRiyuLLi uraiththa kaNakkaRu nalaththanan [thiruvAimozhi 1.3.5]’ ((emperumAn) who has unlimited auspicious qualities, analysed the path of vEdham and spoke mercifully). pinbOrum kaRRaRindhu pEsugaikkA – Later generations also would need to explain using this. To help in that, (he divined such that) future generations can also learn from this and are able to explain to others. Even though there are four other vyAkyAnams (for thiruvAimozhi), for surety of meanings of words, this would be the most useful one for explaining it. 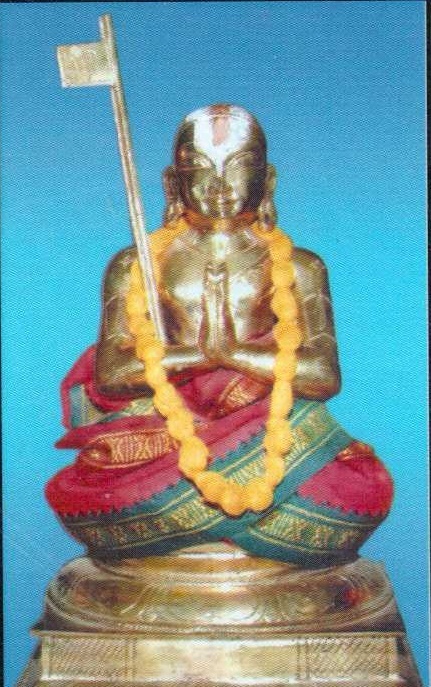 tham periya podhamudan – With his eminent knowledge which helped give meanings of thiruvAimozhi. mARan maRaiyin poruL uraiththadhu – Having the greatness of incarnation from AzhvAr’s divine lips, the meaning of such thiruvAimozhi which is dhrAvida (thamizh) vEdham. uraiththadhu – as text (urai), divined a vyAkyAnam reflecting that. Edhamil panneerAyiram – Edhamil – not having any blemishes; for such thiruvAimozhi, such vyAkyAnam of panneerAyiram (12,000) is divined. That is, it is following the divine mind of AzhvAr. This is being double the size of piLLAn’s vyAkyanam, but going back with half the size of periyavAchchAn piLLai’s vyAkyAnam. So this is being not too small and not too long. If there is any pramANam (reference) that matches this count, then this should be considered as divined according that pramANam’s count. This entry was posted in Other, upadhESa raththina mAlai and tagged 120000, 74, annan, azhagiya, erumbi, erumbiappa, jIyar, kovil, mamunigal, manavala, pasurams, rathina, rathinamalai, raththina, raththinamalai, upadesa, upadhesa on January 16, 2016 by raghuram.